There’s been loads of ink spilt on the foodie flick Julie & Julia. Indeed, I may well be the last food writer on the planet to weigh in on the film. If you’ve been out to lunch, this is the movie where Meryl joyously channels Julia Child and Amy Adams has the unenviable task of attempting to match her on screen as Julie Powell, whose claim to fame is her highly successful blog-turned-book Julie & Julia, which chronicles her kitchen adventures as she ploughs through the recipes in Child’s classic cookbook Mastering the Art of French Cooking. Lots of snarky stuff bandied about regarding Ms. Powell on the web and elsewhere. I don’t quite get all the meanness and I’m not alone. Dianne Jacobs neatly sums up all the whining on her blog Will Write for Food. It seems to center on the fact that Julie is neither a chef nor a writer before she embarks on her online project (some may sniff she isn’t either of these things now). Could, um, jealousy be at work here? Just a guess. Regardless, there’s no denying her admittedly gimmicky conceit — and its popularity — helped to bring Julia Child’s story to the screen. Not a bad thing, folks. Could the talented Ms. Streep have carried a bio-epic on the entertaining Julia Child on her own? You betcha. Would it have put bottoms — and young ones at that — on movie theater seats? Debatable. Regardless, while I agree that it would be great if seriously good food films like Food, Inc. and Food Stamped got the kind of attention this movie has, at the end of the day, it’s a Nora Ephron vehicle people. Relax and enjoy a delicious romp. Here’s what I’ve been chewing over since leaving the theater: Both these women found themselves through food, pursued their passion for cooking with great gusto, and married this obsession with a burning desire to write. Both showed courage and determination in reaching their goals despite setbacks. Both did time in boring government gigs and were supported by kind and loving hubbies. Neither of them had children. I wonder if either would have achieved the recognition they earned if they’d had kids in the kitchen. What do you think? Oh, and there’s one more takeaway message from this movie: Butter is a glorious thing. White House Farmers’ Market: An Idea Whose Time Has Come? Think of the potential for produce everywhere: Barack Obama choosing his favorite potatoes, Michelle bagging tender salad greens, Malia and Sasha squeezing peaches and pluots. Average Janes and Joes from DC and beyond motivated to buy fresh fruits & veggies for a chance to rub shoulders with the President and his family gathering ingredients for dinner. 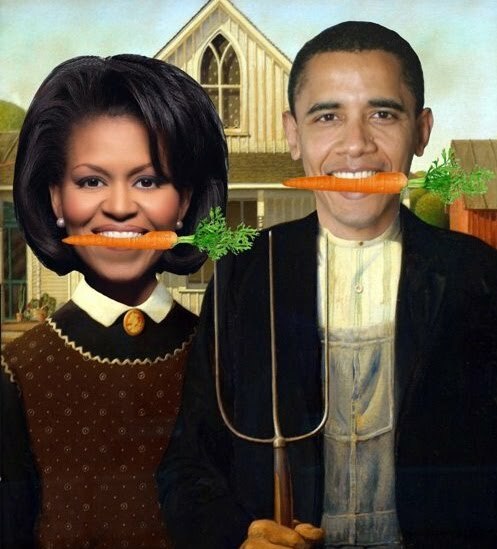 The Prez’s announcement yesterday about plans for a White House Farmers’ Market — check out the informative and frequently fun Obama Foodorama for details — is a bit exciting for anyone passionate about the prospect of folks eating more greens. Call me old fashioned: I just don’t see myself curling up any time soon with a Kindle. 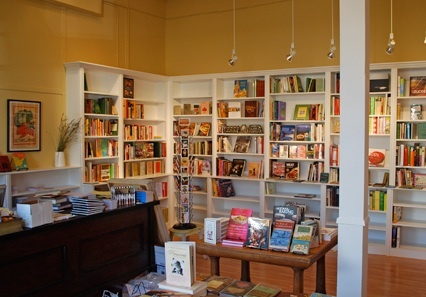 After two beloved bookstores in my neighborhood — Berkeley, a legendary university town no less — closed up shop this year (Cody’s & Black Oak) I swore off Amazon forever.